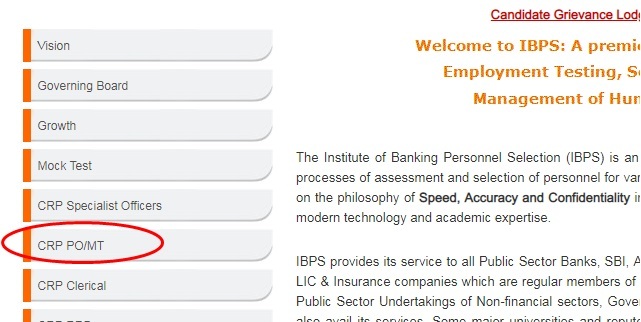 IBPS PO Admit Card 2018: Do you want to download IBPS PO Prelims Call Letter from the official website ibps.in? IBPS has released E-Admit Card for IBPS PO Prelims 2018. The last date to download IBPS PO Admit Card is 14 October 2018. Exam dates for IBPS PO Prelims 2018 are 13th, 14th, 20th and 21st October 2018. IBPS PO Prelims 2018 Result is expected to be out in November 2018. 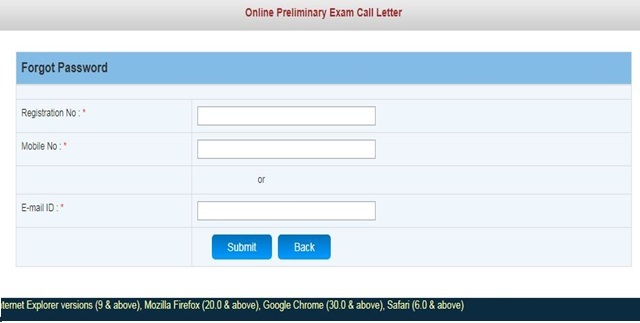 The process of downloading IBPS PO Prelims Call Letter or IBPS PO Admit Card is very simple, candidates need to open the download link and fill their details correctly but candidates often feel difficulty in downloading IBPS PO admit card, especially those who are going to downloading it for the first time. In order to help the candidates, here we have provided complete step by step process to download IBPS PO admit card 2018 from the official website www.ibps.in. 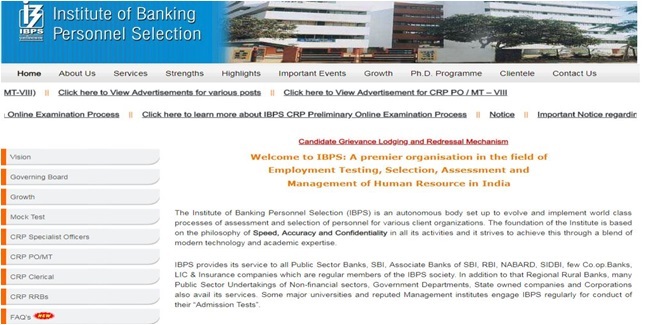 Open www.ibps.in in Google Chrome, Firefox or other supported web browsers. A page will open as shown above. 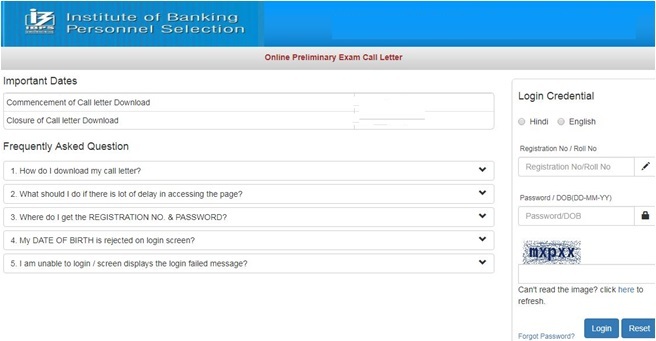 As you will click a new window will open where you will see an option to download IBPS PO Admit Card as shown in the image given below. IBPS PO Admit Card 2018 will be available from a specific date range. 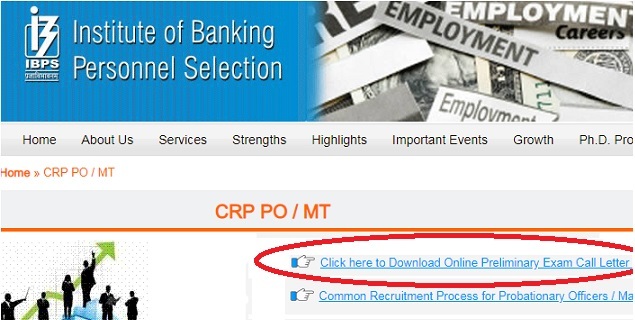 Once the IBPS PO admit card will be available for download you will see the link as shown in the figure given below. As you will click on the link, a new window will open as shown in the figure given below. Here, you need to fill the complete details. Most of the candidates make mistakes while filling date of birth. If you are born on 1 January 1989 then you need to fill 01-01-89 (Not 1-01-1989, 01-01-1989, etc). As you will click on login your admit card will appear for download. As you will click on print (Google chrome) you will get an option to save it in PDF format. Save the PDF of your IBPS PO Admit Card (in a secure location like Google Drive from where you can access it any time). After filling all the details you will click on submit button and you will get the password in your registered E-mail id. This is the complete process to download IBPS PO Admit Card 2018.